The whole town of Sisters seemed pretty laid back. 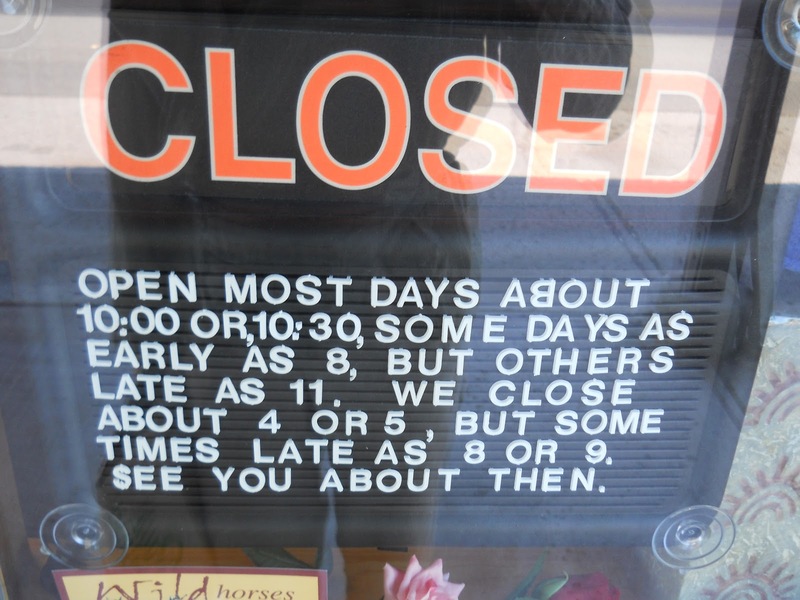 This store's hours didn't surprise me at all. I took my time leaving town. I also still had a couple of errands to run. First I walked into town to mail some food ahead to myself at Timberline Lodge. At this point, my shoes were falling apart rapidly, but that wasn't surprising since they had close to 500 miles on them. I called my mom and asked her to ship a pair ahead to me at Timberline Lodge. Since I had to stop to pick up my mail drop anyhow, I figured I'd send a little food ahead so I wouldn't have to carry it until then. My hotel was at the edge of town, so I had to walk about a mile to get into town, and I didn't want to carry my pack around, so I asked to leave my pack at the front desk which they didn't have a problem with. I did a little window shopping along the way, and even poked my head into a quilting store. Sisters, for those of you who aren't quilters, is famous around the world for the Sisters Outdoor Quilt Show. Who'd have thunk? This little podunk town in the middle of nowhere? So I figured at least one stop at a quilt store was necessary to get the right ambiance. =) I was also a little curious if they might have had any cross-stitching supplies tucked away in a corner somewhere. Charmin once told me that if I ever bought her the supplies, she'd make me my very own PCT National Science Trail patch, and this town seemed the most likely to be able to meet such an unusual hiker need. I didn't find any, though, not in the store I browsed. The couple of girls working there seemed remarkably unsurprised to see a seedy, homeless-looking guy walking around and browsing their store, wishing me a good morning and asking how I was doing. Or maybe they were just keeping a closer eye on me because I looked so seedy? I didn't care, though, and looked around the shop, but as promised, the store only contained a bunch of quilting supplies. I left without buying anything. I stopped for lunch here before leaving town. My hunt for the post office turned out to be remarkably problematic. Now, the maps in my guidebook aren't exactly highly detailed affairs. Most of the towns we resupply in rarely have more than a couple of streets--getting lost is difficult. In this case, the post office was marked as being about one block off of the main street, and I followed it up to where I thought it was located, but found nothing. I walked around the block, knowing the post office had to be around there somewhere, but again came up empty handed. I walked around the adjacent block. Nope. And I followed Fir Street deep into a residential neighborhood, and still found no signs of a post office. I was stumped. Where the heck could it be? I found a family walking towards a nearby playground and approached, asking if they knew where the post office was. "Oh, it moved recently. It's about two blocks east, and five or six blocks north of here. You can't miss it! It's all by itself in an otherwise empty field!" Well, that certainly explains my problem in finding the post office--my map was out of date. Glad I asked for directions--I'd never have found it without help. I followed the woman's directions, walked three blocks east (after two blocks, it looked like the street dead-ended a couple of blocks to the north, but the third block over the street went out for a long distance), and even from there I could see a solitary building with an American flag flying high over it. That must be it. 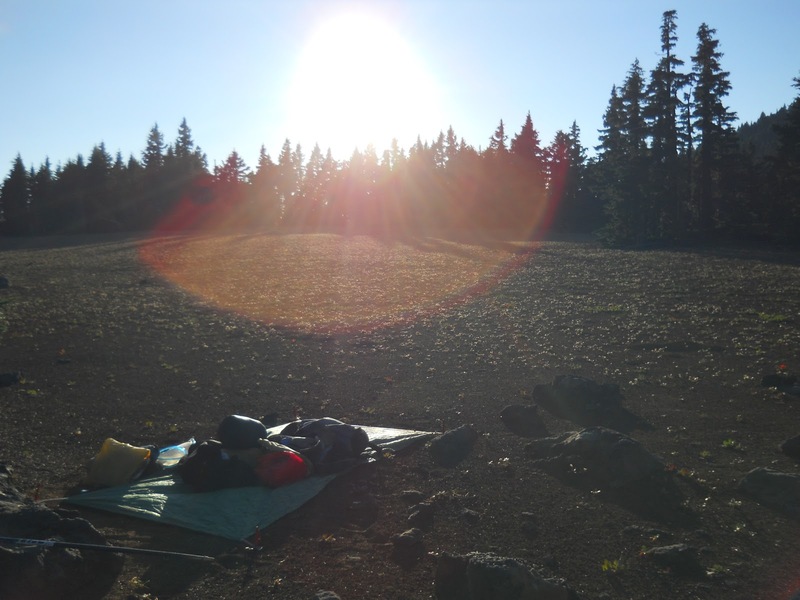 I packed up my food in a priority mail box and shipped it ahead to Timberline Lodge. I looked through the hiker box there but found nothing of interest. Then I headed south again and hit the library. The library was closed when I arrived, but it was scheduled to open in a few minutes. Had I not spent all that extra time looking for the post office in the wrong location, I'd have had a much longer wait to get in. When the doors opened, I snagged a computer and tried to get caught up with my e-mail and other internet goings on for the one hour they let me use it. 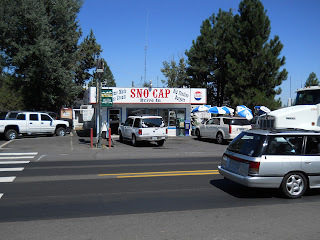 On my way back to the hotel, I stopped at the Sno-Cap Drive In. I walked in, though, since I lacked a car. It must be quite good because the place was packed. I ordered the bacon cheese burger, fries, and a Pepsi. "Extra calories," I requested. Then I returned to the hotel where I picked up my pack. It was time to hit the trail again. I was tempted to stay an extra day, but I needed to get miles in. 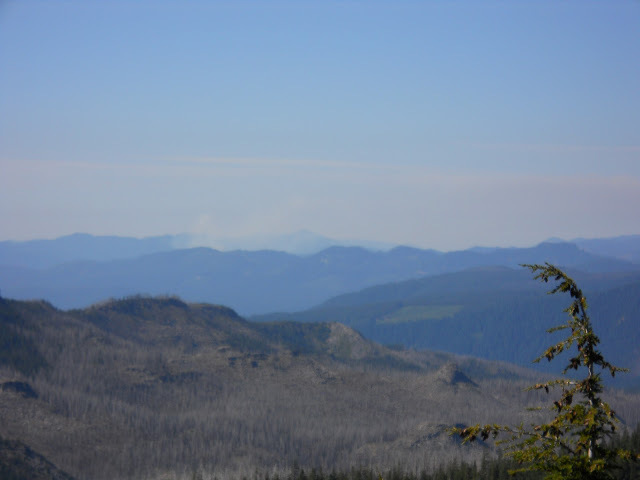 I was still a little concerned about wildfires, and the more miles I got behind me, the less chance wildfires would get in my way. I stepped out onto Highway 20, walked out to the edge of town just past the shopping center next to a wide, dirt shoulder where it would be easy for cars to pull over to pick me up, and stuck out my thumb. Traffic was heavy so I figured it shouldn't take long to get a ride. If, after an hour, I had failed to score a ride, I'd call for a taxi. (I picked up the phone number for one while at the hotel.) I didn't want to sit out on the side of the road all day, after all. But I didn't really expect to have any trouble getting a ride quickly. being dropped back off on the trail. Sweetest ride EVER!!! The return trip was a bit harder to snag. The almost non-stop flow of cars meant I didn't have a chance to put my arm down, and it started growing increasingly tiring to hold it up. I tried to switch arms every five minutes to give one thumb a rest while the other worked its magic. It was exhausting! I ended up waiting through 246 vehicles this time--nearly double the number that drove past me while trying to hitch a ride into town--but in half the time. Sometimes a vehicle would drive by that I knew I had pretty much zero chance of getting a ride from, such as a UPS truck. So I'd give my thumb a rest and just wave to the driver instead. Not only did the UPS probably have rules against their drivers picking up hitchhikers, I guessed, but it probably wasn't even going to where I needed to get to. I also waved to motorcycles that drove past. I didn't want to hitch a ride on a motorcycle anyhow. The driver got out and walked around to the passenger side, and I walked over to him, still not sure he could possibly be stopping just to pick me up. "I'm heading to Portland," he told me. "Where are you going?" "I'm not sure where that is," he told me. "Don't worry--it's about 15 miles up the road here, on the way to Portland." Sweet! He was really going to pick me up! In an ice cream truck!!!! He told me that there wasn't room in front for my pack and I'd have to store it in the back of the truck, if I didn't mind. No, I didn't mind at all. He opened a door in the side of the truck and I threw my pack in. I couldn't help but notice that the back of the truck was completely empty. Not an ounce of ice cream to be seen anywhere. It was still freezing cold in the back, though. I hopped into the cab of the truck, and we moved out. 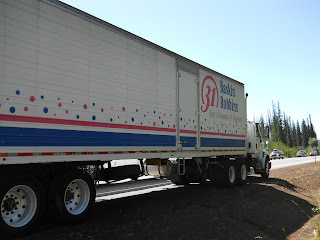 I told him what I was doing out there, and he told me about his route which started in Portland then looped south through Grants Pass, up towards Bend, and now heading back to Portland. He'd just finished doing the last of his deliveries, which explained the lack of ice cream in the back of the truck. I didn't care anymore, though. I was thrilled just to be riding in a big rig. I'd never ridden in one before, and it wasn't some plain and boring Wal-Mart big rig or anything. This was a Baskin Robbins truck! It was an ice cream truck! =) I told the driver that as soon as I got back home to West Seattle, I was going to go to the Baskin Robbins there and have an ice cream in his honor. Turns out, he's also delivered ice cream to the store there in West Seattle, so then we started talking about that area. 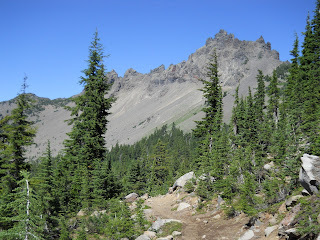 He dropped me off on the trail at Santiam Pass. I went back to the register at the cache to brag about my hitching exploits and see who might have passed by while I was in Sisters, then continued my hike north. 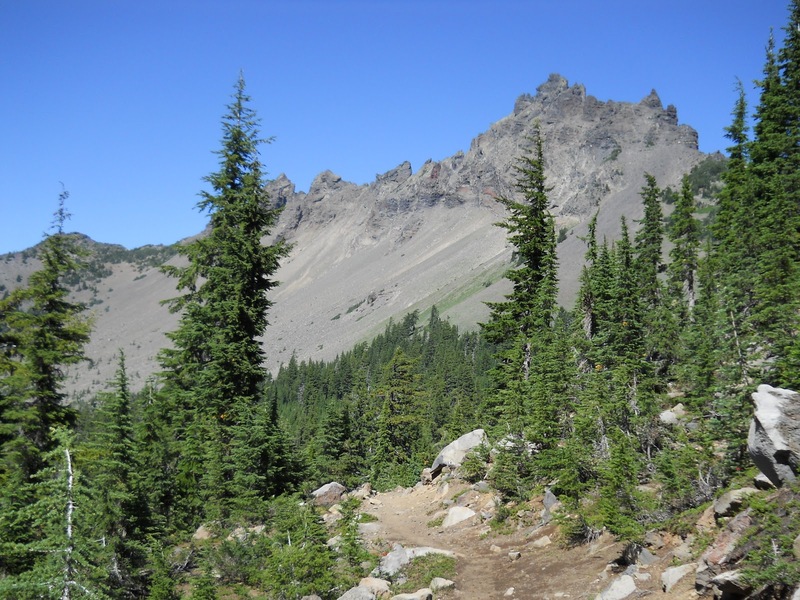 Another hike in Sullivan's Hiking Oregon History told the strange story of a railroad line over Santiam Pass which was used by a single train that consisted of an empty boxcar drawn by mules. 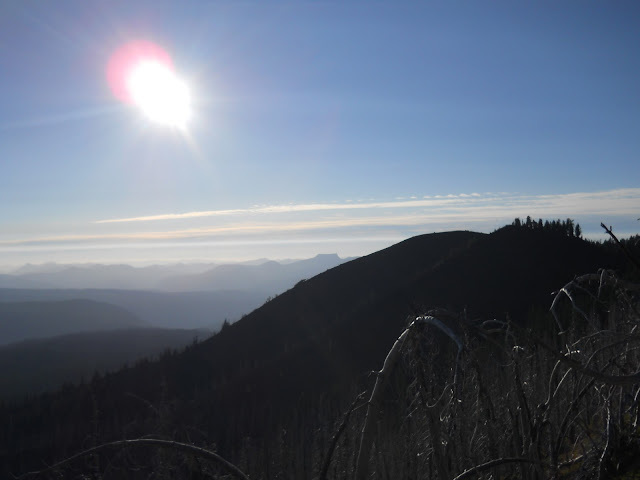 The hike described in Sullivan's book is a bit off the PCT and I had already done it before in years past, so I had no inclination to get off trail and do it again. The story is one of my favorites, though, involving a character named Colonel T. Egenton Hogg, who fought in the Confederacy during the Civil War and served time in Alcatraz after the war as a political prisoner. After getting out of Alcatraz, he raised money to build a railroad through the Cascades over Santiam Pass, but Portland-area interests attempted to thwart him at every turn. They bought up key properties he needed to run his railroad to Newport's harbor. So Hogg countered by announcing that Newport would not be the western terminus of his railroad--he stopped laying track at the eastern edge of Yaquina Bay and laid out Yaquina City, an entirely new town with its own harbor, then bought a steam-driven ocean liner christened the SS Yaquina City and scheduled regular sailings to San Francisco. 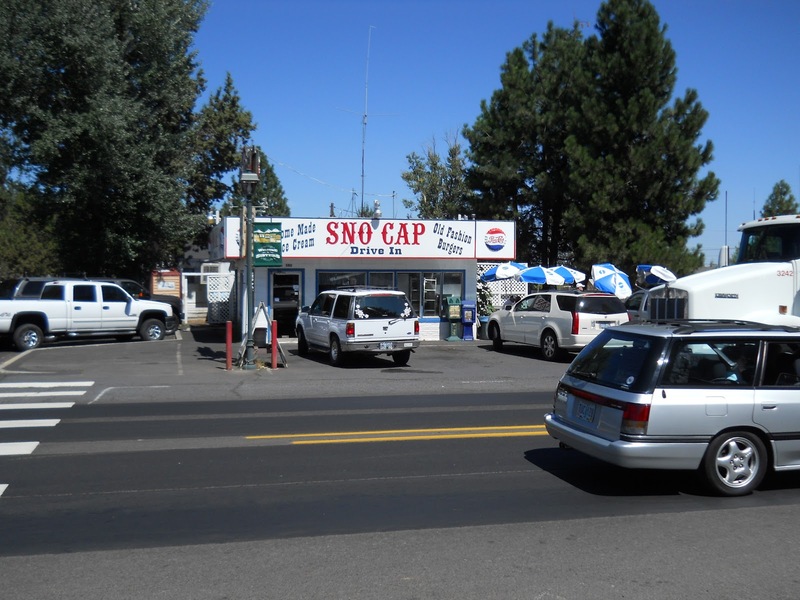 Hogg's franchise required that he complete the Cascade crossing before he could claim a federal land grant across Eastern Oregon, and the success of his plans hinged on getting that free federal land. Time and money, however, were running short. In December of 1887, his steamship ran aground at the mouth of Yaquina Bay. Everybody on board was rescued, but the bar's surf pounded the ship into splinters. Sabotage seemed likely, but there was no proof. Insurance covered the loss, but in the meantime, he would have no income from his train to Yaquina City, and did not have the money to complete the final 43 miles of track over the Cascade Summit. And without a train at the Cascade summit, he'd lose his federal land grant. So he threw his resources into one last, daring gamble. He abandoned the North Santiam track where it stood unfinished near present-day Detroit to build a completely unconnected section of track over Santiam Pass. Hundreds of mule-drawn supply wagons set up a makeshift camp at Big Lake, and over a thousand men built 11 miles of track across the summit around Hogg Rock. Other workers in Albany disassembled a boxcar, packed the pieces into wagons, and hauled it up the pass. There the car was reassembled on the deadend rail line and pulled back and forth along the track by mules. At this point, Hogg brazenly informed government officials that he had fulfilled the terms of his franchise: the Oregon Pacific Railroad was in fact running a train across the Cascade Range. (Nevermind that the railroad connected to nothing and was drawn by mules.) It looked like Hogg's bluff might pay off. Until.... a tug that was helping to maneuver Hogg's newly built steamship across the Newport bar when the towing cable suddenly snapped. The SS Yaquina Bay ended her maiden voyage by drifting to rest beside her derelict sister ship, where she too was smashed by the surf. The wreck mirrored the previous shipwreck so precisely that few people believed it could be a coincidence, but still, there was no proof that the cables had been sabotaged or that his Portland rivals were responsible. And this time, insurance did not cover the loss. Within months, the Oregon Pacific Railroad defaulted on its interest payments to bondholders, and that was the end of that. The old railroad grade over Santiam Pass was never connected to anything and abandoned, and parts of it are still visible today. from wildfires on the horizon around the base of the mountain. well, though. This was the best I could get. A lot of burned areas along this section of trail. Definitely no problem with wildfires here anymore! Late in the day, time to start looking for a place to camp! Great reading been following your tale since fall. Stumped on Fir Street...Classic Ryan. Like ArtGekko, I have a funny B/R story... I had a friend that worked at a B/R store and asked if I wanted a birthday ice cream cake from the display case. I said sure, who was going to turn down a "free" birthday ice-cream cake? I invited some friends and family over for a little desert party, we all got a slice and about the same time took a bite.... yuuuuuKKKKK, we all spit out the most STALE ice cream I had ever tasted. It was the display case cake that sits there for who knows how long, and then they had it in the freezer, till they gave it to my friend then to me. That was the end to my party. 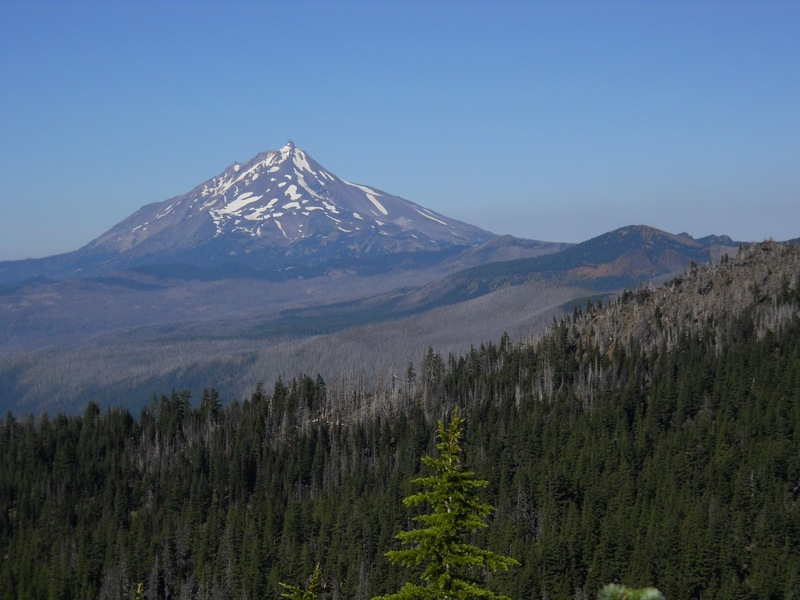 In your blog, your already on the North Sister? That was fast, from the S. Sister mountain to the N. Sister. 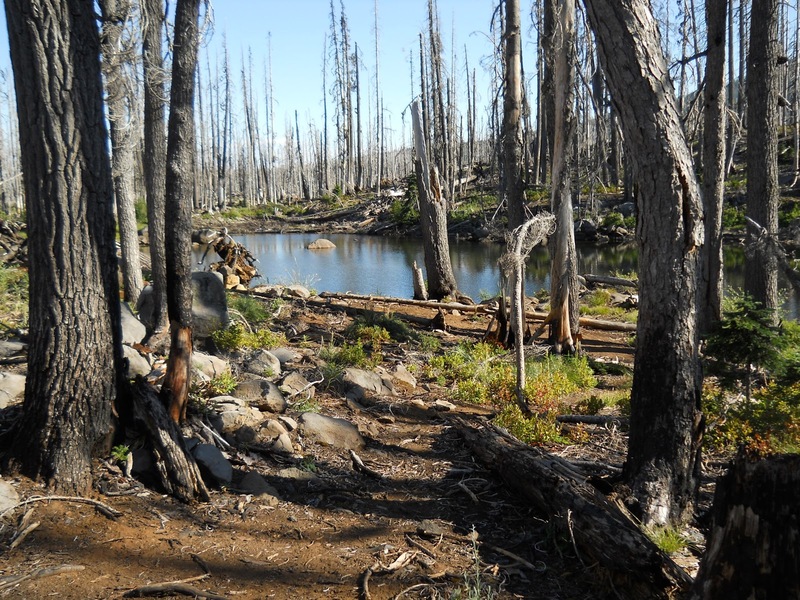 I was hoping to see and here more about the Mink Lake Basin located in the South Sister area, that the trail passes through. 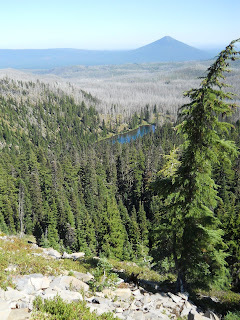 I hiked that area from the N. Sister through the Mink Lake area with a 60 lb pack, took me two weeks, 125 mils. And you did it in one blog post. Can't wait to see your next blog post. PS, the hike was about 40 years ago. One of my first jobs was working at Baskin Robbins in Menlo Park, CA. One evening my friend and I got the bright idea to kill the roaches. One of us went over to Draegers and bought some Raid. We sprayed underneath the the freezers and in the various cracks and crevices. Did I mention that we were open at the time? What we didn't realize is that roach spray doesn't kill on contact. We had roaches crawling all over the place, up on the glass, on the counters, everywhere. We were helping customers and trying to discretely flick the cockroaches off of displays. As a result, to this day, I have a cockroach phobia. BTW, I still will go to Baskin-Robbins. I love to get a two scoop sundae with chocolate chip ice cream and the caramel sauce--YUMMY! I fell in love with BR in college. They would DELIVER to the dorms. That story about Hogg and his Oregon Pacific Railway was fascinating wrought with hope, frustration and finally disappointment the entire way. Whatever became of Hogg? 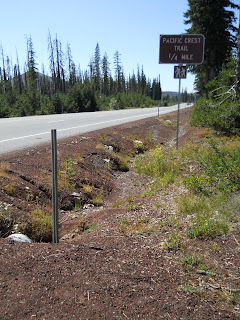 The sign on the road announcing the PCT in 1/4 mile, could it have been correct years earlier? Perhaps the PCT had been rerouted and it was actually located 1/4 mile ahead at one time? I was happy to read that you seemed to hold no more grudges against Charmin and was looking forward to having her make you a special and unique "PST" patch. We're you able to get together again to work out that request? But I love all the seasonal flavors, too....especially pumpkin! So, what's your favorite BR flavor?